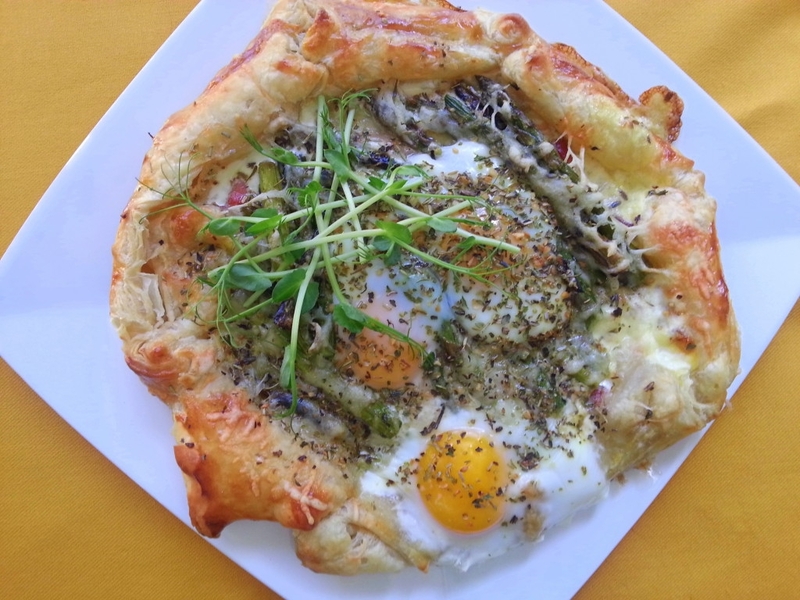 Nothing like a good breakfast during the weekend munching on an Egg Crostata. 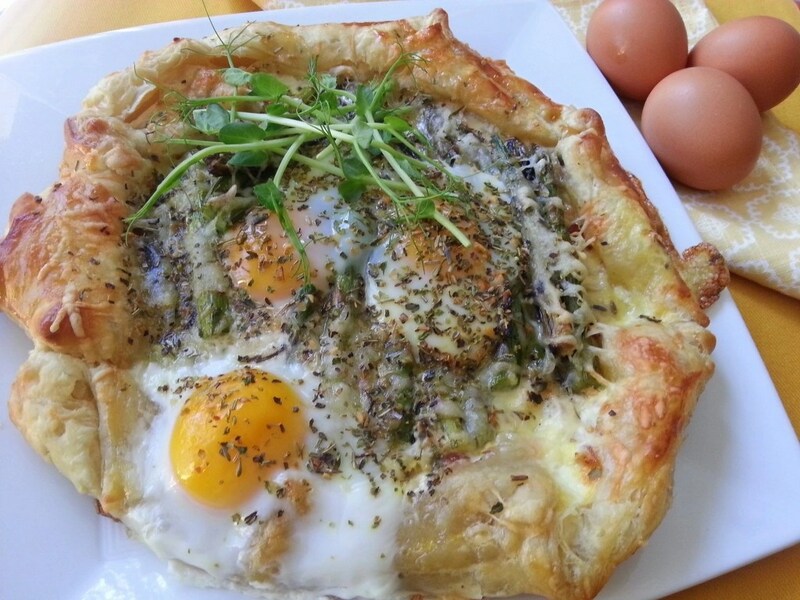 If you want to treat your family to a surprising dish I recommend for you to try this Egg Crostata with asparagus. It is easy and delicious way to celebrate any day! Preparation time: 45 minutes. Serves 3 guests. Approximate cost per person $3.00 depending on local ingredients cost. You will need a baking sheet, a brush, a small bowl, a whisk and parchment paper. Defrost the puff pastry following package instructions, place a sheet of parchment paper in a baking sheet. Pour a drop of oil in the baking sheet before placing the paper, that will allow the paper to stick to the surface and maintain the paper in the desired position. Add the puff pastry sheet and then place the other on top forming an octagon. 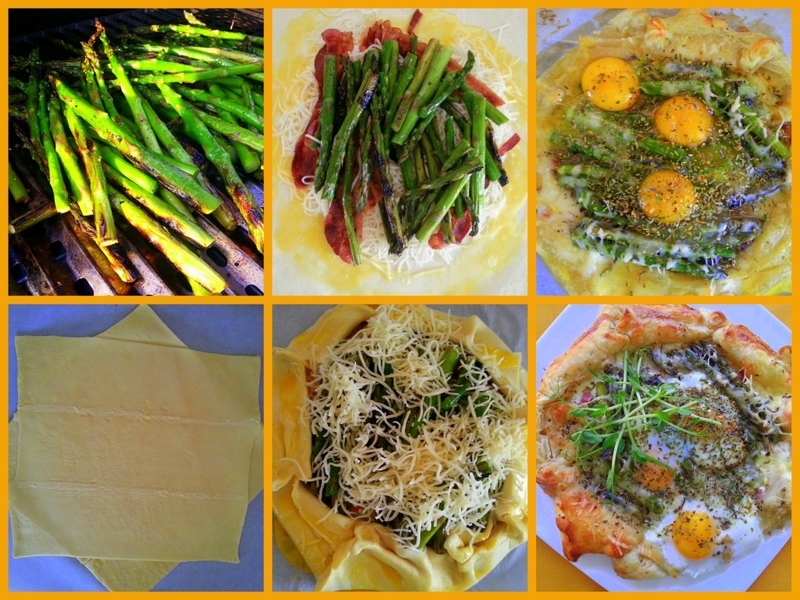 In the middle of the puff pastry sheet add the cheese, the bacon and the asparagus and top with more shredded cheese. In a bowl crack one egg and beat with a whisk, then use the batter to brush around the edges of the dough. The egg batter works as an adhesive to make sure the dough edges will stick when closing. Then take each edge and stick to the next just like if you were closing a pie. Place the crostata in the oven set at 400 degrees fahrenheit and cook for 20 minutes. Take out and crack 3 eggs evenly, lower the heat of the oven to 350 degrees fahrenheit and cook the crostata inside the oven for another 15 minutes until the eggs cook to be sunny side up. decorate with micro-greens and serve warm. This breakfast option is easy and a good recipe to surprise everybody in the family. An outstanding recipe! Radiant with flavor and easy to prepare, just stellar! Many thanks Deb appreciate your comments. Have a wonderful day! Hola Vero que bueno que te gusto esta receta me avisas que tal te salió, un beso! I found your work on Twitter. I arrived seeking the colors and the creativity. I return for the flavors and the recipes. Such good stuff! Hi Diane many thanks for following me and for your kind comments if you try one of my recipes please let me know how you liked it, have a blessed day!